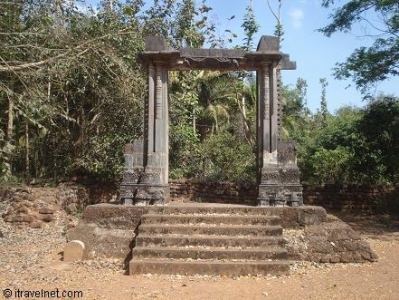 Goa News |Kadamba gate named after Adilshah? Kadamba gate named after Adilshah? Heritage activists in Goa have alleged that the Archeological Survey of India (ASI) was spreading misinformation about a 16th century monument belonging to the erstwhile Kadamba dynasty in Old Goa, the state's former capital. A group of heritage activists have informed ASI that the famous Gate of Adilshah Palace, which has been protected as a heritage monument, was actually constructed by Hindu Kadamba rulers and not Adilshah, a Muslim ruler, as claimed by the central heritage agency. "The ASI has put up a plaque that says that this is the Gate of the Palace of Adilsha at Old Goa.I strongly debate and oppose this statement by ASI since the granite grill on either sides of this granite structure show clear figures of the Kadamb Lion, Peacock design, flowers and Hindu deities," Sanjeev Sardesai, a renowned heritage activist, told PTI. The monument is located in front of St. Cajetan's Church at Old Goa, 10 kms away from here and is a part of cluster of World Heritage Monuments notified by UNESCO. "This gate made of Basalt consists of two pillars decorated with mouldings and fragmentary lozenge shaped perforated screens. The linter above the pillars is not original towards the inner side. Some structural remains of laterite have been exposed which might form part of this complex," the plate inscripted below the arch by ASI reads. Sardesai said with the 3000-year-old Bamiyan, Afghanistan Buddha statues incident fresh in mind, does it not seem odd that a Muslim ruler would think it proper to put Kadamb motifs and Hindu Deities at the entrance of his palace. "To my knowledge in the Muslim faith, they do not rever any idols or figures and pray facing towards Holy Mecca.Then how come a claim is made that this Gateway is that of Adilshah's Palace," he argued. . I salute Mr. Sanjeev Sardesai. Surely ASI done mistake. This is the Kadamba Gate of Hindu architectural style. Surely, the ASI has made a mistake. Muslim ruler would not put up Hindu deities at the entrance of their palace. Authorities need to write to the appropriate authorities of ASI. They will surely correct their mistake and put up an appropriate plaque. The Gentleman names Yum Reda is absolutely rite. We hear of the Vodlem ghor in Old Goa used as a Torture chambers during the era of Goa Inquisition. Just to tell you This was the same palace used for the Inquisition in the early days. Which was later demolished and what remains is only a Arch today..
Mr. Bhushan and Atul Kadamb, the descendants of the Kadamba king still reside in Goa at Margao. They still own a part of Kadamba hill in old goa. Another descendent is S G Kadamb who resides at Panaji and who has written a complete book of Kadamba history. ASI should take help of these people in conservation as records of Kadamba kingdom are still available with them. there is another place ,very close to the kadamba gate in old goa.its known as vhodalem ghor.meaning a large house.this is also historical.this is the place ,where,the missioneries used to punish the novo-converts to christianity,for still worshipping their former hindu gods/or for still practicing hindu customs.this was the place infamous for inquisition in goa.the hindus in the island of goa were also severely punished here,for practicing their faith.every soul in goa used to be damn scared of this place.a letter wrirer ,a catholic old gentleman,had written in local navhind times ,how the clergy used to torture.the title of his letter said,"malle,malle ani kiristaon kelle. "many wriers both hindu/catholic and foreigners have written about this place.also,mentioned in the goa`s freedom struggle. Mr.Sardessai I salute you Sir for atleast I know we have an asolt goenkar who is wide awake and kickiing and thoroughly informative. Infact you need to coach the tour guides of goa because most of them have no clue what they are talking about . Sad What a collection of waste garbage.